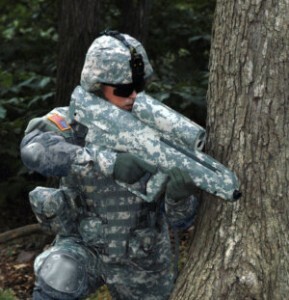 The XM25 is an airburst grenade launcher derived from the XM29 OICW. It fires 25 mm grenades that are set to explode in mid-air at or near the target. A laser rangefinder in the gun is used to determine the distance to the target. The user can manually adjust the detonating distance by up to three meters shorter or longer. The gun automatically transmits the detonating distance to the grenade in the firing chamber. The grenade tracks the distance it has traveled by the number of spiral rotations after it is fired. These features make the XM25 more effective than traditional grenade launchers at the task of hitting targets that are behind cover or dug into the ground.